The bald eagle (Haliaeetus leucocephalus) is a conservation success story with populations recovering in urban and rural habitats across the continent. Populations declined during the 1900s initially through hunting and then pesticides; however, data suggest that the western North America population has been stable since the 1990s. Stanley Park is home to several bald eagle nests, with four to five active in a given year. The Stanley Park Ecology Society (SPES) has monitored active nests in the Park since 2004, with surveys conducted every year except for 2015 and 2016. The SPES team observes how many breeding pairs have returned to the Park and how many eaglets are successfully reared from each nest. 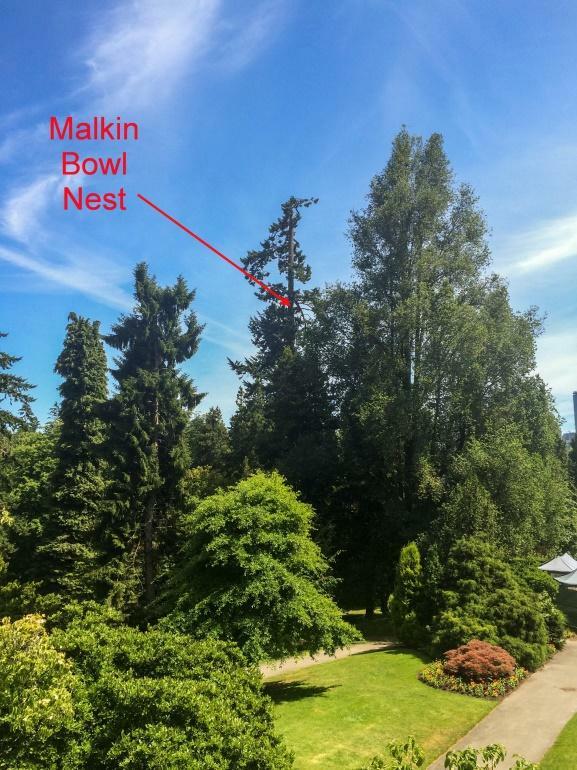 Near SPES’ offices in the Stanley Park Dining Pavilion, a pair of bald eagles has started to fix up their nest near Malkin Bowl and SPES staff are eagerly awaiting signs that egg-laying has occurred. Like most Vancouverites, eagles are very concerned with real estate and prefer to nest in large trees with nice viewscapes. Once a suitable location has been found, both males and females work together building the nest with sticks and twigs; this is an essential part of their pair bonding ritual. 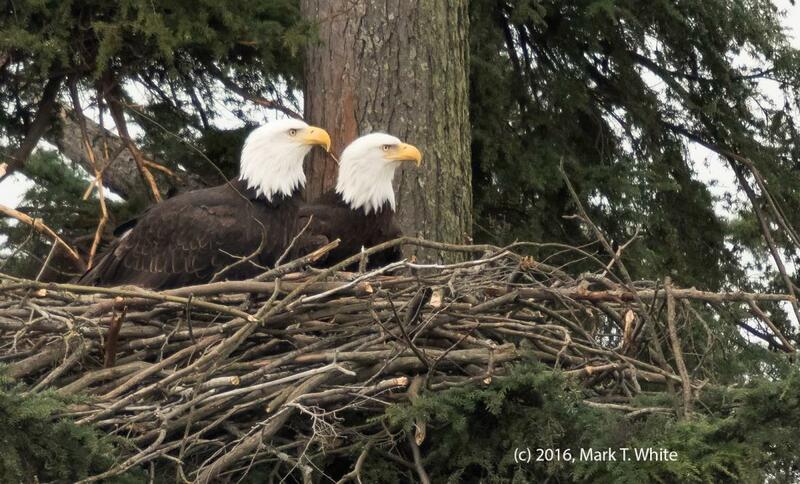 Eagles have strong nest site fidelity, often returning to the same nest and nesting territory each year. If they successfully produce young at a nest, they are more likely to return to that nest the following year. A typical nest like the one near the Stanley Park Dining Pavilion may contain 1-3 eggs. Both male and female birds take turns brooding, sitting on the eggs for up to 35 days before they hatch. Once born, the young eaglets will stay in the nest for about 11 to 12 weeks. Around this time their downy feathers are replaced by juvenile feathers and soon they will begin to practice the fine art of flying on their own. Typically only half of the eaglets born will survive to fledge, so naturally the parents guard the nest very closely taking turns to hunt for food. 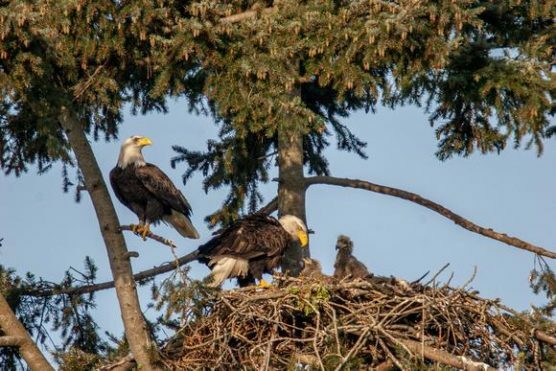 The next time you are in Stanley Park and looking to spot eagles in action, the nest across from the baseball diamond just west of Prospect Point may be your best viewing option. Last year a breeding pair set up shop in a tall hemlock on the downward side of the slope. From this vantage point it is possible to see directly into the nest without the aid of binoculars, so be sure to have your camera ready in case they return this year. You can learn more about Vancouver’s nesting eagles in SPES’ 2014 Vancouver Bald Eagle Update.